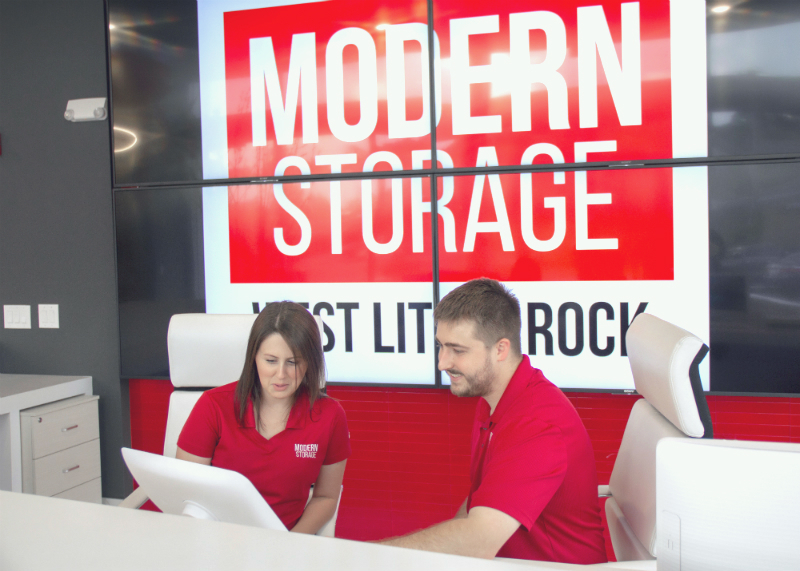 At Modern Storage, we're trying to make self-storage more modern by taking the pain out of the entire experience. From renting your unit to paying your bill, you can do everything online! But, if that’s not easy enough for you, there are several other ways you can pay your bill, check your account status, and more. You have four easy ways to pay your bill: in store, online, over the phone, or at our 24-hour kiosk (West Little Rock location only). To pay your bill at any Modern Storage location, you can stop by anytime Monday through Saturday from 8:00 am to 6:00 pm. At our West Little Rock location, you can even come by on Sunday from 1:00 pm to 5:00 pm. To pay your bill online any time, any day, just tap the Make a Payment button right here on our website. That will take you to a list of our self-storage locations. There, tap the “Pay Here” button next to your storage facility’s location, and log into your account. You must know your account number and unit number, so have your storage unit paperwork handy. To pay your bill over the phone, you can call your Modern Storage facility anytime it’s open. Someone should always be on the other end to take your call. But, if we miss you, just leave us a message and we can call you back. Outside our West Little Rock location, there is a 24-hour service kiosk. Follow the instructions on the screen to log into your account and pay your bill. Credit and debit cards can be use in store, online, or over the phone. When it comes to auto-payments, you can set them up through the staff at your storage location’s office or online. If using your checking account, you will need to supply your account number and routing number. This is the best way to pay your bill because you will not have to stress about missing a payment! Please note, if you would like to pay your bill with a check, you must either bring it into the office at your storage facility or send it to the facility in the mail. When you send it in the mail, it must be sent out on or before the first day of each month, so your account does not accumulate any late fees. Late fees occur after the first day of the month when all customers' rent is due. Starting on the 2nd, a $1 late fee is added every day until your balance is paid in full. If your outstanding balance is not paid by the 10th, your account will be locked. This makes your gate access code invalid, meaning you will not be able to enter the storage facility. Have any questions about how to pay your bill? Contact us for help from a member of our friendly staff.